At the time of this post I am close to heading off for Hawaii. I have signed up for a four-day surfing photography workshop with leading US adventure photographer Michael Clark and surf photography guru Brian Bielmann. We are based for this on the north-west corner of Oahu, and big waves regularly come in on the north coast. On the last day of the workshop, my partner Jools will join me and we will go to Hawaii (“the Big Island”), Kauai and Maui. The map shows the various islands and routes to where we will be staying. It does not include detailed routes around each island because I have not considered that yet. You can click on the map to see it larger if you want. . 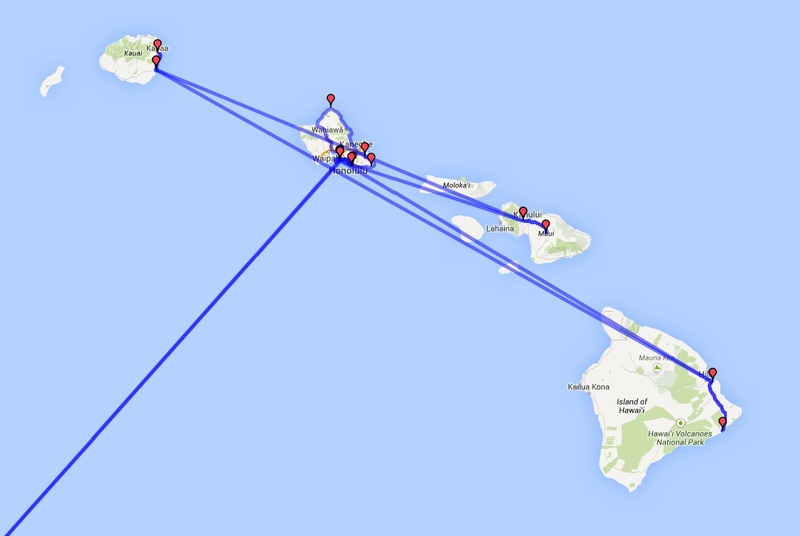 Here is the itinerary: 18 February Fly from Canberra to Honolulu, Oahu, Hawaii. 19-22 February Surfing Photography Workshop with Michael Clark, north west corner of Oahu. 28 February Fly from Hilo, Hawaii to Lihu’e, Kauai. Three full days in Kauai. 4 March Fly Lihu’e Kauai to Kahalui, Maui. Three full days in Maui. 8 March Fly Kahalui, Maui to Honolulu, Oahu. Overnight in a hotel at Waikiki. 9 March Fly from Honolulu to Canberra.